Together with other rural areas in Spain and other European countries, the provinces of Teruel and Castellón have interesting examples of dry stone constructions, art inscribed on the Representative List of the Intangible Cultural Heritage of Humanity by UNESCO in 2018. The art of dry stone walling concerns the knowhow related to making stone constructions by stacking stones upon each other, without using any other materials except sometimes dry soil. Such structures testify to the methods and practices used by people from prehistory to today to organize their living and working space by optimizing local natural and human resources. 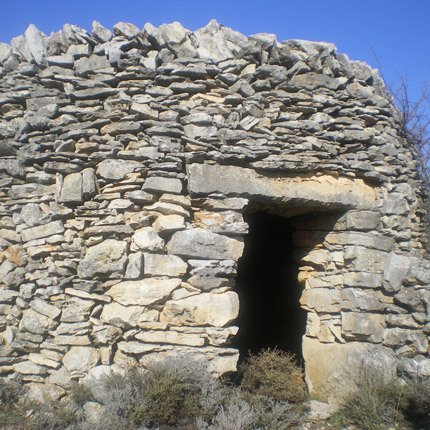 Dry stone structures are always made in perfect harmony with the environment and the technique exemplifies a harmonious relationship between human beings and nature. Dry stone can be seen all over the Maestrazgo area in dozens of kilometers of walls, huts, etc. Mosqueruela preserves interesting examples. Travelers are invited to follow several thematic routes.